Month after month, my new home keeps on surprising me positively. 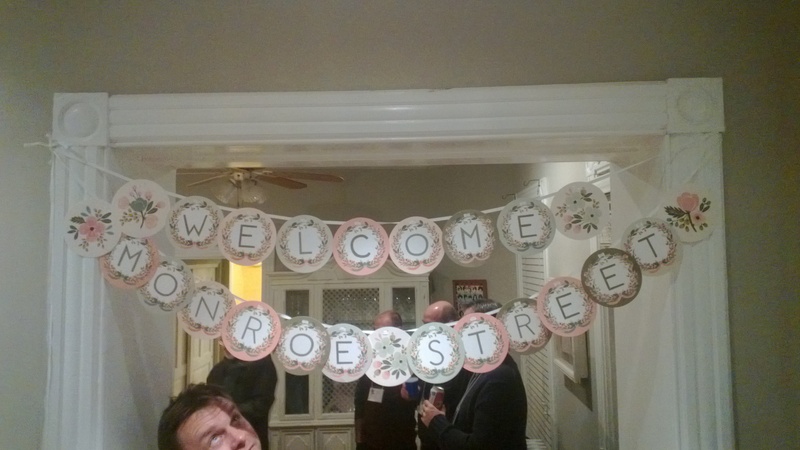 At the beginning of December I learned that our 2-block strip of the Monroe Street has an active street association and received an invitation to a progressive dinner. I had never heard of the concept before. The idea is that a number of residents open up their houses for neighbors to enjoy one course of the dinner at each home. The other dinner participants contribute by providing food, so that the hosts do not need to worry about that. The schedule looked like this: appetizers at 5:30pm, soup at 6:30pm, salad at 7:15pm, dinner at 8pm, dessert at 9pm, and nightcap at 9:45pm. Busy with other Saturday activities, I missed the first two courses, but joined the fun starting from salads that were served at our place. 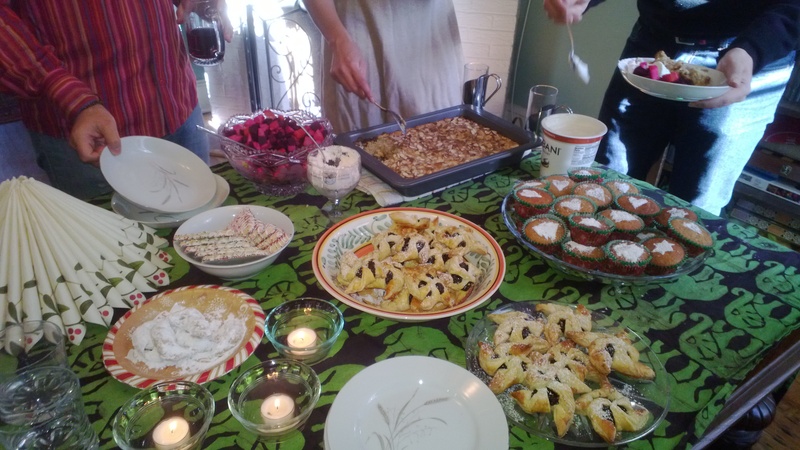 I was amazed when exactly at 7:15pm the doorbell rang and the house filled with people, young and old, kids, adults, grandparents, students… Food contributors brought amazing salads featuring everything from pomegranate seeds to jícama. After 45 minutes, the “boss of the block”, an energetic 9-year-old rang a bell to signal that it was time to move on. We followed the crowd across the street and got to enjoy numerous mains and sides, endless desserts and finally a night cap (or a few) in three more homes. What a great way to learn to know your neighbors and strengthen the community feeling! I have been a big fan of gingerbread houses since a kid. In our family it was always my mom who made the gingerbread dough and prepared the parts for the house, and we kids focused purely on decorating. My mom was also in charge of assembling the house with melted sugar, as that step was considered way too dangerous for kids. At the age of 26, I decided I was finally old enough to maneuver the whole process, and since then I have built a house every other year or so. 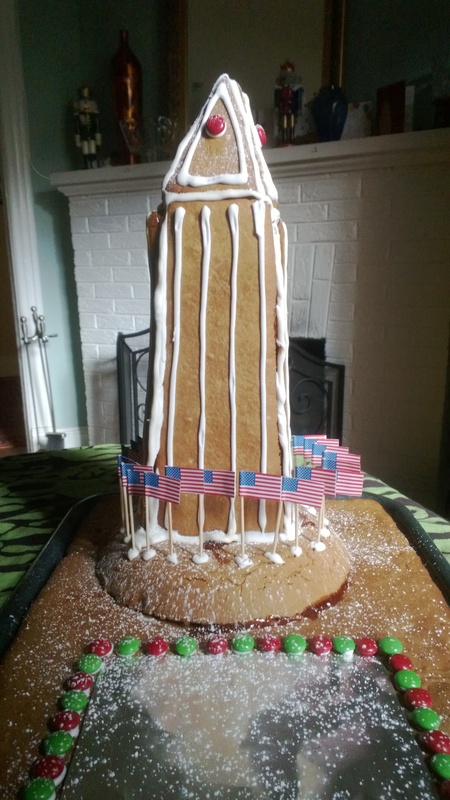 Inspired by my new home town, this year I selected the Washington Monument as my gingerbread house project, and I must admit I am very happy with the result. 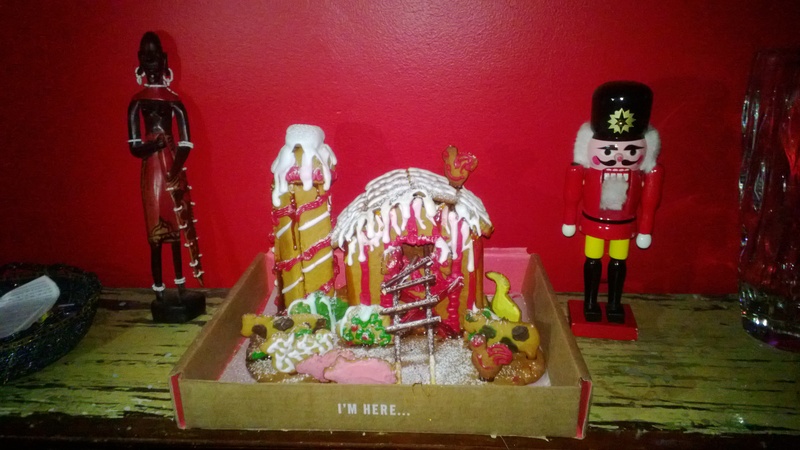 Getting company to my multi-day gingerbread house workshop made the project more fun than ever: My designer friend had never done anything similar before, but she was eager to give it a try and turned out to be a natural gingerbread house talent! Without using any patterns, she created a lovely farm scene with a barn, a silo and a whole array of animals from piglets to roosters. The other workshop participant was one of my house mates who loves building just about anything. Leveraging his experience from making surfboards out of fibreglass, he was great at dealing especially with 3D shapes. The credit of the hill under the Washington Monument goes to him. 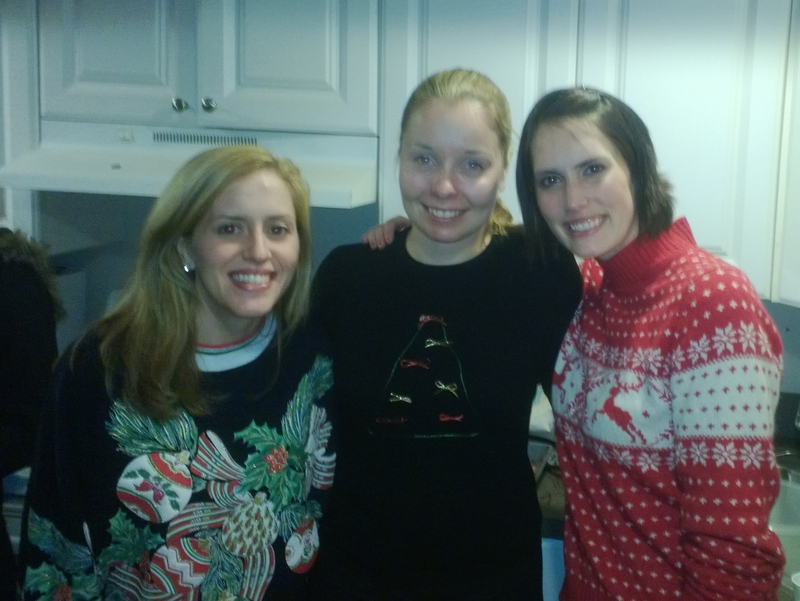 In the past couple of years, ugly holiday sweater parties have become an “ironic” megatrend in the US. Also I got invited to two. Although the last weeks before Christmas were quite busy, I did not want to repeat my rookie mistake from Halloween of showing up without appropriate attire. My plan A was to head to Goodwill to look for a suitable sweater, but it turned out there is no Goodwill in DC; the nearest ones are in Virginia and Maryland. Instead of looking for another thrift store, I chose an alternative approach as my plan B: I decided to ‘uglify’ my old black snowboarding sweater myself! At the least the following additional highlights deserve to be mentioned: Opening the holiday season with The Nutcracker by Washington Ballet at the Warner Theatre, baking Finnish Christmas buns and pin-wheel shaped prune tarts for the Fulbright Holiday Party at the Slovenian embassy, baking even more and hosting a Pre-Holiday Brunch & Hangout for friends, checking out the National Christmas Tree by the White House, the U.S. Capitol Christmas Tree and the ZooLights, experiencing my first white elephant gift exchange, and eventually getting introduced to the 30-year-old ultimate holiday movie classic A Christmas Story (highly recommended!) and promoting Rare Exports and the Finnish film industry in return. With this, I wanted to wish you and your loved ones Happy Holidays and lots of Sweet Surprises in 2014 already a few weeks ago. Most holidays are over by now, but as today is the orthodox Christmas, I use the opportunity to finally wish you all ‘Hyvää Joulua ja Onnellista Uutta Vuotta 2014’! Best of July | Miss… on Welcome Home!